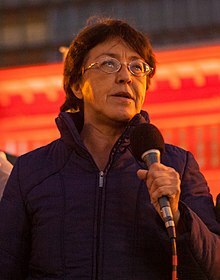 Gloria Estela La Riva (born August 13, 1954) is an American socialist activist with the Party for Socialism and Liberation (PSL) and the Peace and Freedom Party. She was previously a member of the Workers World Party. She was the PSL's 2008 presidential candidate, and ran as the PSL's presidential candidate again in the 2016 race, with Eugene Puryear and Dennis J. Banks as her running mates. La Riva was born in Albuquerque, New Mexico on August 13, 1954. She graduated from high school and began attending Brandeis University in 1972. She first ran as a third-party candidate for President of the United States in the 1992 presidential election, representing the Workers World Party, although this was an unofficial run as basically a placeholder on a few state ballots. She had also been the Workers World Party vice-presidential candidate in the elections of 1984, 1988, 1996, and 2000. She joined the Party for Socialism and Liberation in its split from the Workers World Party. La Riva was also the Peace and Freedom Party candidate for Governor of California in 1994, receiving 72,774 votes (0.9%). She ran again in the 1998 gubernatorial election, capturing 59,218 votes (0.71%). She also ran for San Francisco Mayor in 1983 (7,328 votes – 5.4%) and 1991 (2,552 votes – 1.4%), and for Congress in 2010 (3rd place – 2.5%). In the 2008 Presidential election, La Riva received 6,821 votes, the 10th highest vote total. La Riva has also been the director of the National Committee to Free the Cuban Five, and president of the typographical sector of the Northern California Media Workers Union. She attained ballot access in eight states: Vermont, New Mexico, Iowa, Louisiana, Colorado, Washington, New Jersey, and California. La Riva was a candidate for the Peace and Freedom Party nomination for Governor of California in 2018.